Part of the triumph of finishing a PhD, beyond the well-deserved rest and graduating with a poofy hat, is legitimately being able to put ‘Dr’ in front of your name. Of course anyone at any stage can just click the ‘Dr’ option when filling out a form but it is more fun when you know that it was earned. And yet there are times when it probably shouldn’t be used. Having a title of Dr as a female can be useful. It’s surprising how much attitudes change once people, particularly salespeople, realise your pay packet might be larger than their pre-conceived stereotype. It’s also a great comeback to the oft-asked question “Is that Miss, Mrs or Ms?” I got this repeatedly when disconnecting/ reconnecting the utilities after moving house for my first post doc position. Top customer service tip: always presume Ms. It’s just polite. Such enjoyment carried through to my first overseas conference as a post doc. There was no way I could resist booking flights as Dr M. This was particularly rewarding when busting the flight attendant’s own pre-conceived stereotype. Flight attendant, looking at the random old guy next to me: Doctor M? Me, looking at the gluten-free meal she was bringing: That’s me. Flight attendant, frowning, looking at the guy, back at her list, back at the guy: Doctor M? Me, looking amused and vaguely triumphant: That would be me. On the return flight, the attendant had a different attitude. New & Improved flight attendant: Dr M? N & I flight attendant: Excellent! I know who to call in an emergency. 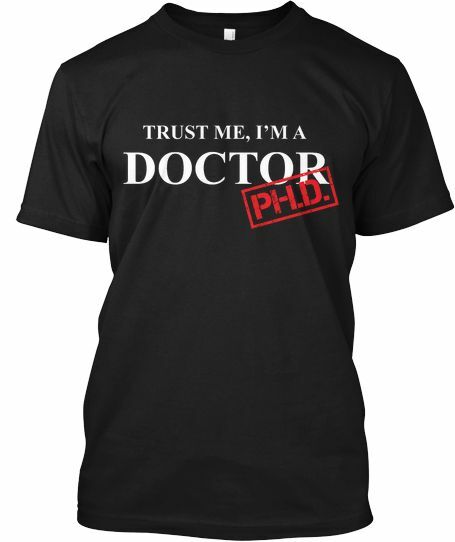 Me: Um, actually it’s a PhD doctor. Rapidly-Downgraded flight attendant: Oh, so not a real doctor. Being confused with a medical doctor is hazard for PhD doctors. How do you explain to someone in an emergency that no actually you’re just not that kind of doctor? This is also why I no longer run half marathons. Just to be absolutely certain that I’m not confused with a medical doctor. You can never be too careful. Once the Dr title has been earned there is nothing wrong with using it wherever and whenever possible because at some stage it will no longer be a novelty. Nowadays, more often than not, I go by Ms M not Dr M.
But it’s still good to know that at some stage, if it was ever needed, I can pull out that trump card and insist on being called Dr.